1.Never let children handle fireworks. 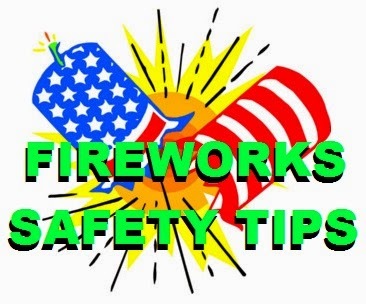 2.Do not consume alcohol while handling or lighting fireworks. Alcohol impairs your senses, judgment, and reaction time. Impairment leads to accidents, injuries, and possibly death. Be a responsible adult ~ don't consume alcohol and handle fireworks. 3.Have a fire extinguisher or a source of water nearby. 4. Keep a First Aid Kit nearby. Keep a First Aid Kit nearby for treatment of minor burns. 6.Don't try and relight a "dud." 7.Do not throw burned out sparklers on the ground. 8. Always wear proper clothing whenever you use fireworks. This includes cotton or denim clothing, long pants, eye protection, covered shoes, and (if necessary) ear protection. 9. Keep fireworks away from open flames. 10. Never throw or toss fireworks at another person or animal. 11. Never carry fireworks in your pocket. 13.Use fireworks in an open space that is clear of spectators, buildings, vehicles, debris and flammable materials. Keep spectators a safe distance away from the display. We recommend at least 35 feet for fountains and other ground items and 300 feet for aerial items. 15.Read all warning labels carefully and follow any written instructions. 16.Light fireworks on a hard, level surface..
17.Keep body parts clear of fireworks. Sri Senthi Crackers wants you and your family and friends to enjoy the beauty and excitement of the fantastic fireworks we offer. But more importantly, we want you all to remain safe. Don't let a wonderful scene turn into a nightmare by ignoring these simple "common sense" safety guidelines.